Some install cat doors inside the house to give cats access to a specific area without having to keep a door open. Or, to give cats access to an area while keeping dogs out of there. 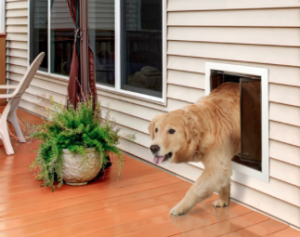 When it comes to other types of problems, such as chewing on things, a pet door can alleviate some of the underlying boredom through providing access to another environment. But, a dog can be just as bored outdoors as indoors.